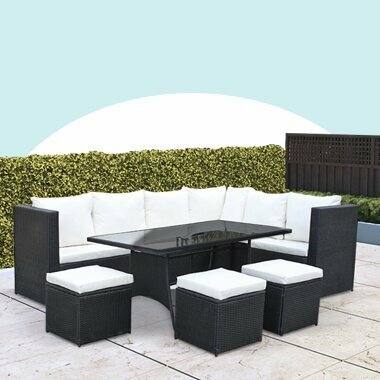 Do you love being outdoors, enjoying a warm sunny day and firing up the barbecue grill? Then it is essential to ensure you have got the perfect griller ready on hand to prepare your outdoor meals for your friends and family. No matter if you prefer a modern, easy-to-use gas BBQ, or a more traditional coal BBQ to help give you that well-loved, authentic BBQ taste, there is a BillyOh product for you. This is as we have a wide range of choices and a large variety available for you to browse through. 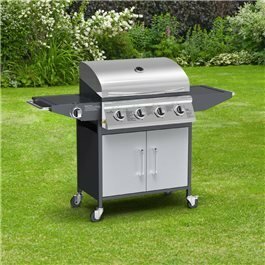 In particular, we offer BBQs in a wide range of sizes, featuring various cooking methods such as a burner gas BBQ, charcoal BBQs and a kettle charcoal BBQ. These are accessible at budget friendly prices. 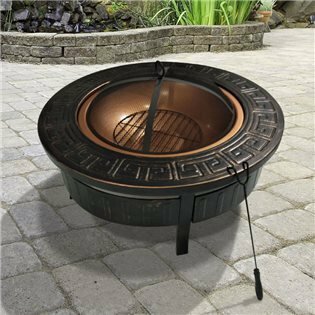 In addition, we offer relevant accessories to heighten your barbecue cooking experience, these include barbecue covers and BBQ regulators. 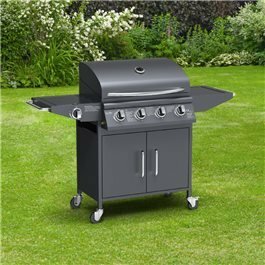 Gas BBQs can provide you with the authentic charcoal BBQ flavour we all love so well. 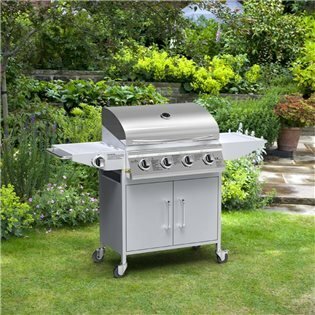 High quality gas bbqs are easy to light and reach the optimum cooking temperature at a quick pace. The design of the barbecue allows you to maintain a controllable even cooking temperature across the whole grill meaning part of your food is unlikely to be burnt, also controllable by choosing either a four burner or a six burner barbecue. Additionally, should you run out of fuel, the bottle changing process should be quick and easy, only taking you a couple of minutes (on average) to resume cooking. 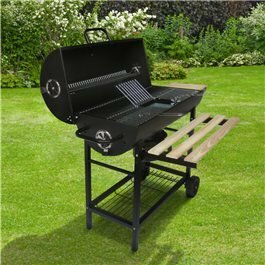 As well as gas barbecues we also offer charcoal barbecues. Available as either kettle barbecues, drum barbecues or in a barrel design. Charcoal barbecues may not be as convenient as gas barbecues but they do have a whole host of advantages. First of all, they produce a unique smoke flavour. This is as the dry heat of charcoal sears the meat quickly. This can create a crusty, caramelised exterior combined with a smoky flavour. Secondly, they tend to be less expensive and more portable than other barbecues as you are not having to cart a fuel bottle around but rather a bag of charcoal. A kettle BBQ is perfect for those looking for a low and slow cooking process, lengthening the time it takes for the kettle grill to reach a very high temperature. This helps brings out the best of your seared meat and burgers. Furthermore, our portable range of barbecues including tabletop barbecues and portable oil drum barbecues gift you the freedom to eat wherever you like. Ideal for those who enjoy camping, fishing or simply going for a picnic. A BillyOh portable barbecue is perfect for the nomads or simply those who don’t have the option of storing a large barbecue, or for those who do not have a designated barbecue dining area. However, deciding which barbecue is best suited to you, or even understanding the difference between the different styles make be difficult. Therefore, we have put together the ultimate barbecue guide to try and address any questions and quieres you may have during your barbecue buying expereience. 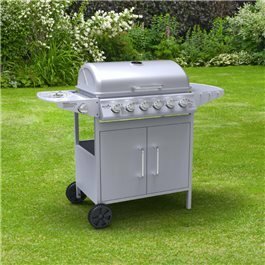 As well as useful tips for once you have your BBQ starter set and how you should best go about maintaining it. Additionally, take a look at our customer stories where you have the chance to hear from our customers directly as they share their BillyOh experience. When the weather is pleasant, there is no better way to spend time with your friends and family than hosting a barbecue. Whether you will be caravanning, camping, or simply firing up your barbecue in your backyard, you’ll be able to enjoy a delicious meal prepared in the great outdoors. Unfortunately, many injuries involving barbecues and outdoor cooking occur each year, but by keeping the following tips in mind, you’ll be prepared to enjoy your barbecue safely. 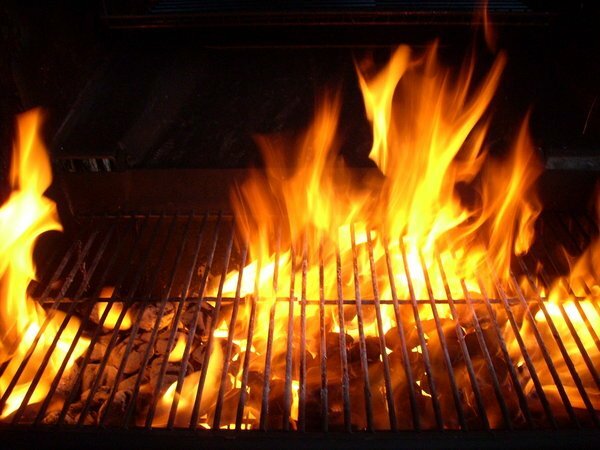 BBQ Fire Safety Guide – Avoid the dangers surrounding fire and BBQ use. Barbecue Care Tips – Use these important BBQ care tips in order to avoid a fire. Disposable BBQ Risks – Understanding the risks associated with disposable BBQs. Always keep your BBQ in good working order, and never use it if you suspect a problem. Only use a BBQ on a flat location away from trees, shrubs, and structures. Keep children and pets away from cooking areas, and never leave your BBQ unattended. Always have a bucket of sand or water available in the event of a fire emergency. Never move a BBQ until it is completely cool. In addition to these general BBQ safety tips, there are additional guidelines depending on the specific type of BBQ that you are using. Only light your barbecue using cold coals with recognised fire starter or lighter. Only use the minimum necessary, and avoid the use of petrol. Use enough charcoal to cover up the barbecue base to a depth of 2 inches (or about 50 mm). Avoid putting hot ashes directly into the dustbin—this is a potential fire hazard. Before you change the gas barbecue cylinder, make sure the tap has been turned off. Always change your barbecue cylinders in a well-ventilated area, preferably outdoors. When finished cooking, turn off the gas cylinder before you turn off the BBQ controls in order to use up any residual gas left in the pipe. If you suspect a leak, brush soapy water along the joints and look for bubbles. Once you arrive at a caravan site, identify the firefighting resources available. Keep a fire extinguisher near the caravan exit door. Ensure all members of your party can operate the doors and escape windows. Keep gas barbecue cylinders outside of the caravan unless your space has a special ventilated compartment. Keep barbecues and other cookers away from the entrance of your tent. Ensure that your cooker is stable and won’t be knocked over by drafts, pets, or running children. Never use liquid fuel appliances, if avoidable. Ensure that disposable gas barbecue cylinders are completely empty before changing them. Ensure proper distance (10 meters at minimum) between your tent and the fire or barbecue. More room may be required in windy conditions. Never build a fire or use a BBQ on peat soil. Clear away brush, leaves, and grass. Create a fire stack that will collapse inward when burning. Never leave a fire unattended, and be wary of sparks or flying embers. Properly extinguish a fire before leaving or going to bed for the evening. Determine where the nearest emergency telephone or fire point are located. Never leave barbecues or campfires unattended, especially if you have children or pets with you. Clear away glasses and bottles from your campsite after you barbecue—they could magnify the sun’s rays and cause a fire. Space tents at least 6 meters (or 18 feet) apart. Use battery-powered lighting inside or near your tent—never use candles. Don’t smoke, especially inside a tent. Keep all cooking and barbecue equipment away from tents. Using a BBQ grill is an activity that your entire family can enjoy. By making safety a priority, you’ll get the most enjoyment out of your barbecue. Hidden BBQ Dangers – Be aware of these hidden BBQ dangers in order to keep yourself—and your family—safe.